The baby sign language dictionary includes over 600 common signs. Start with the Top 10 Starter Signs, then expand following baby’s interest. For each word, there is a video, diagram, and teaching notes to make learning new signs easy. For babies just beginning their signing journey, start with the top ten starter baby signs. From there, follow your baby’s interests to find new words that baby is motivated to learn. To help you teach words that you don’t encounter a lot in real life you can print out the baby sign language flash cards. Substitute – substitute a word close in meaning. For example, many people use the word up, instead of carry me. Improvise – create your own signs using a memorable gesture. In the signing community, these improvised signs are called home signs. Just be sure to keep a record of your improvised signs, they are easy to forget! ASL Dictionary – you can find nearly any sign your heart desires in one of these full ASL dictionaries. Lifeprint, Handspeak, or ASL Pro. If you found this information useful, check out our award winning baby sign language kits. The kits make teaching Baby Sign Language faster and easier. 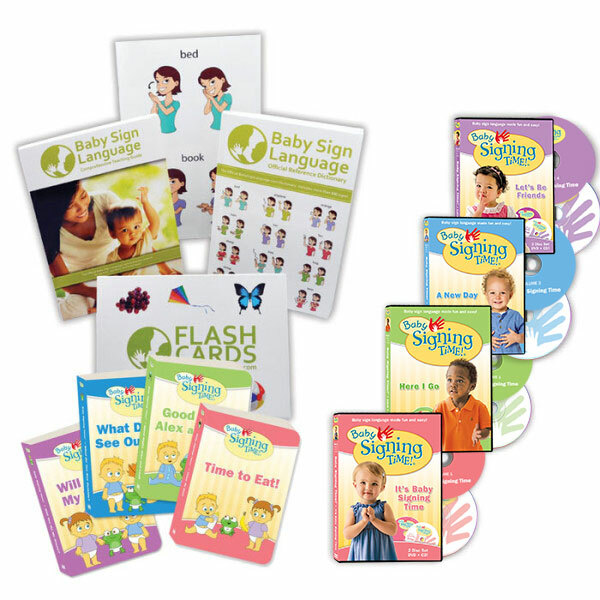 Baby can learn signs while being entertained by the Signing Time DVDs, or learn new signs with the Sign Language Flash Cards. 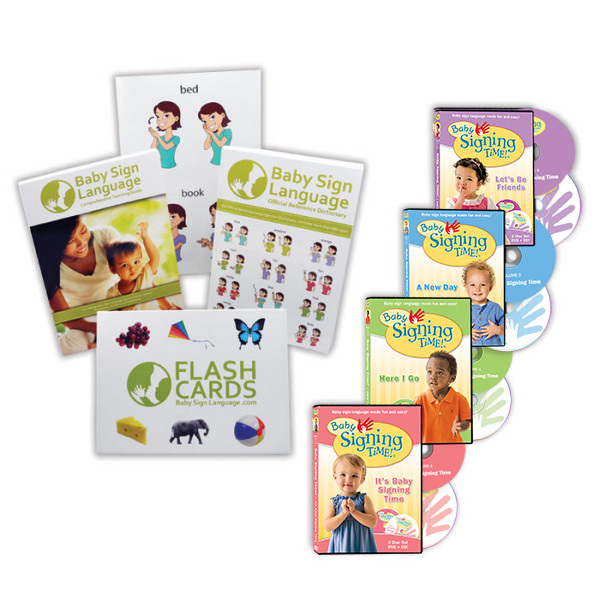 The Baby Sign Language Kits include everything you need to get started with signing, at a steep discount. 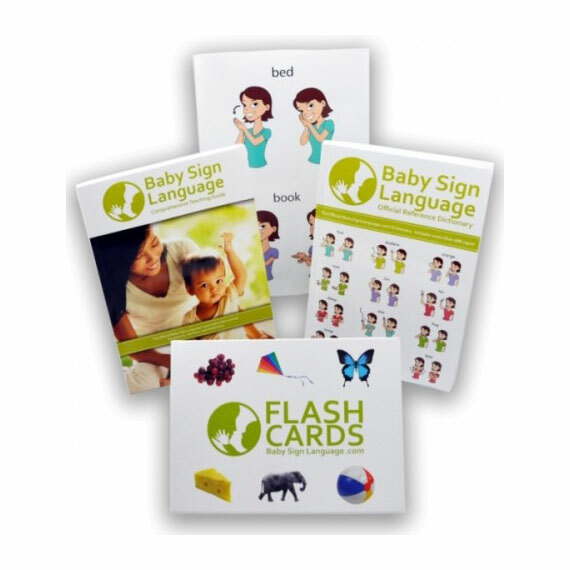 The Deluxe Kit includes: (1) Signing Time DVD, (2) Baby Sign Language Guide Book; (3) Baby Sign Language Dictionary: (4) Baby Sign Language Flash Cards; and (5) Baby Sign Language Wall Chart. Communication with our 15 months old is amazing thanks to your kit. We already know all the flash cards which she loves. Using the dictionary is tricky though as she just wants to rip the pages off. If you could send a weekly email with new signs, that would be awesome and helpful to continue our journey. Follow us on Facebook, I try to share tips and tricks with frequency as well as publish new signs. do you have a sign for veteran or soldier? Thanks for the feedback. We will take it into account as we plan for the future. I am a grandparent who would like to learn to sign in order to communicate with an expected grandchild. What materials would you recommend? I think your best option is the Standard Kit. I believe my daughter has signed to her mum and I. She used her first finger after her thumb to point to the centre of her palm of her hand. Can anyone tell me what it is? Hopefully it’s not rude. It is very interesting to learn baby’s signs languages. I would love to study more on this interesting subject to make me a good teacher to our two months old boy and a two and half years old baby girl. Hi! Just wondering what the baby sign is for “rooster”? Body parts are signed by pointing to it. I don’t but I have added your requests to the list. I have a 3 year old who will not speak or even try to sign. Can someone please tell me how to get him to sign? Please reach out to a speech therapist and development specialist for an assessment. All of our resources are available in digital format for free. Each flash card has a link to a video that you can enjoy after printing your resource. I am beginning at 58 years old what is the sign for God if you don’t mind. Our website is for baby sign language. Google ASL to find resources for adults. You will find them far more enjoyable. My almost 11 month old loves to eat black olives. I want him to sign “olive” to tell me that is what he would like to eat. Everywhere I have looked shows that you finger spell olive. Do you have a suggestion for a shorter/simpler sign? Why not create your own sign. For example you can have baby close one fist and mark the cavity of the olive by pointing to the top of the fist and then sign the color black. No plans for an App. Unfortunately we have tried it in Beta and there is no demand for it. I fully forgot about that. Start with your dominant hand with fist closed and thumb up and make a circle in front of your face. Close the circle by moving your index and middle finger in a quotation motion. What would be the sign fo “lady-bird”, please? Lady-bird as in female bird or as in first lady? Per the reports we have received from other customers the videos play globally.